The Modbus to SNMP gateway can be used to make SNMP devices look like a set of Modbus holding registers on the Modbus network, or make Modbus registers look like a set of SNMP variables in a MIB on the IP network. 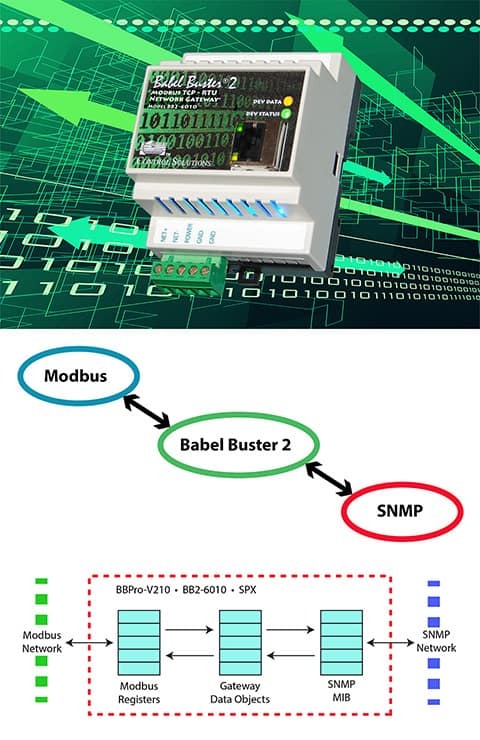 The Babel Buster gateway functions as a Modbus to SNMP protocol translator to connect Modbus RTU or Modbus TCP devices to an SNMP network. The Babel Buster gateway will also connect SNMP devices to a Modbus RTU or Modbus TCP network. The Modbus to SNMP gateway, or SNMP to Modbus gateway, includes an SNMP client - sometimes referred to as SNMP manager - that automatically polls MIB variables in SNMP devices according to a table of rules that you define. The SNMP data is retained in holding registers within the gateway, and other Modbus masters may then poll the gateway to obtain the SNMP data presented as a Modbus holding register. The process may be reversed, resulting in Modbus writing to the SNMP device. The Modbus to SNMP gateway also contains a Modbus master that will automatically poll other Modbus devices, retaining a copy of their data in the gateway’s own holding registers. The gateway’s holding registers are accessible from SNMP as MIB variables. Therefore, other SNMP managers can read or write Modbus data in the various Modbus devices connected via the gateway. The gateway functions as an SNMP server - sometimes referred to as SNMP agent - for providing Modbus data to other SNMP devices. The Modbus to SNMP gateway can act as Modbus master or slave, meaning a PLC can readily access data found in SNMP devices. Both Modbus TCP and Modbus RTU are supported. The Modbus to SNMP gateways also include threshold rules that you may create for purposes of sending SNMP traps. When the value held in any of the gateway’s internal holding registers meets the criteria of the threshold rule you define, the gateway will automatically send an SNMP trap message. Some models of Modbus to SNMP gateways also include a trap receiver. This means other SNMP devices can send traps to the gateway, and the result will be placing data derived from the SNMP trap into Modbus holding registers. Follow links below to find the model that fits your application. You will find detailed information for each model, including User Guide and How-To videos.